The Senior variety is perfect for adult cats over the age of 7 years.A complete and balanced food with all the vitamins and minerals your cat needs. Cats love the taste of fish. Now James Wellbeloved has made a mouth watering Ocean White Fish & Rice recipe for your feline companion. Our new, exciting variant captures the freshness and bounty of one of nature's great providers - the oceans. Feed James Wellbeloved Ocean White Fish & Rice to your cat and see how healthy she looks. Even fussy cats love it. Prepare to be amazed! Special Omega-3 oils for a soft, shiny coat. A natural approach to urinary tract health. The same delicious taste, right across the range. Natural, healthy, ingredients. With no added artificial colours, flavours or preservatives. 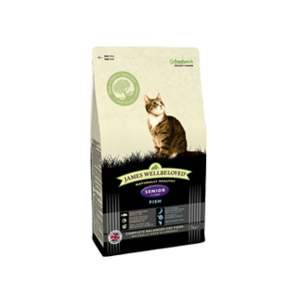 Ocean White Fish & Rice cat food is a complete dry food full of natural ingredients. Succulent fish, rice, maize, tomato, carrot and potato. All baked into crunchy nuggets and smothered in delicious olive oil. With no unhealthy additives. Pure and hypo-allergenic. Cats can suffer from food allergies, producing poor skin and coat condition and stomach problems. The most common allergens are milk, beef, and wheat. So Ocean White Fish & Rice cat food contains none of these problem ingredients and thus avoids the allergies. Your cat could be fitter and healthier as a result. Special Omega-3 oils for a soft, shiny coat. A healthy diet makes for a glowing coat. As well as all the vitamins and minerals your cat needs, we've included a unique blend of Omega-3 oils to nourish and condition your cat's coat to a silky soft, glossy shine. We've added natural cranberry extracts, known to be beneficial to urinary tract hygiene. And kept the magnesium level low to help keep your cat's urinary system in perfect health.